Being the biggest island of Cyclades, Naxos offers many options to the traveller who wishes to explore a variety of activities during their holidays. You can start with hiking; keep in mind that mount Zas is 1000m high. If that is not enough, then how about some mountain biking? Plenty of countrysides to enjoy on your bike and a great variety of roads to choose from, coastal or mountainous. Scuba diving, snorkelling or just SUP, you can explore a vast variety of beaches. No matter how many days you stay on Naxos, there will always be more hidden niches for you to discover. If you were asked how you imagined the place where Zeus, the father of the 12 ancient Greek gods, was raised, chances are your reply would include the following: fertile, imposing, exuding primaeval majesty. If you were asked what you imagined to be the dominant features on the island where Dionysus, the god of merriment, was born and raised, you would probably include fun, song and dance. If finally, you were asked how you imagined the scene of the wedding of Dionysus and princess Ariadne, you would probably respond, “Enchanting, almost magical…”. This is how we describe Naxos! Naxos island is one of the most consistently windy locations in the whole of Europe, especially during summer time and has more than 240 days blowing 15+ knots yearly. The Meltemi wind was known by the old Greeks as the Etesian (annual) northern winds and results from a high-pressure system (>1025) laying over the Balkan/Hungary area and a relatively low pressure (<1010) system over Turkey that is channelling jet-effect (venturi) between islands increasing the wind. Furthermore, it can be characterized as one of the few Mediterranean winds that do not necessarily die out at the end of the day and can easily last more than three to six days and start over again. Especially where Naxos Kitesurf is located, the microclimate at the spot can't be predicted, and it's almost always 3-5 knots more than the rest of the island. The climate is naturally Mediterranean, with warm summers and relatively mild winters. Because of the size of the island, touring it requires transportation. Day trips will reveal some of the harder to get to locations and beaches that few tourists ever explore and even some locals have never been to! Naxos Kitesurf Club can organise these for its customers and transfers from the port or the airport. On the island there a wide variety of rental car, motorbikes, bikes, etc. The ones that move with a speed of approximately 20 to 25 knots and in most cases carry from 1500 to 2500 passengers and a large number of vehicles. They take about 5.5 to 6.5 hours to get to Naxos, depending on weather, the season and the ports of call on the way. The faster ferries (including Highspeed and smaller Catamarans) that may reach up to 40 knots and usually carry up to 1000 passengers. Not all of them can carry vehicles. They take approximately 3.5 to 4 hours to get to Naxos, again depending on weather, the season and the ports of call on the way. The second major way to make the trip to your great holiday is by air. 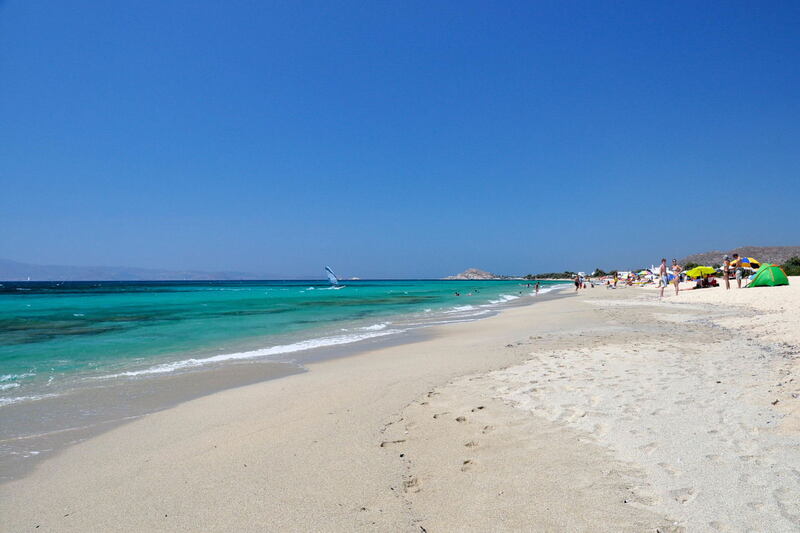 By far the most popular for tourists is the charter flight from their country directly to Naxos, usually by smaller propeller driven aircraft or, a jet flight to Greece’s National Airport and take a connecting plane to Naxos. It is a good idea to have your local connection flight booked early in advance since things can get very busy during the peak season and seats can be tough to book on the connecting flights. There is also the possibility fly to Mykonos or Santorini direct and then take a connecting boat to Naxos that makes approximately ½ to 2 ½ hours depending on the type of ship. Top tip: If you come by plane I suggest direct flight to Santorini and then by ship to Naxos. If you come with your own car, then from Athens, Rafina Port during high season would be better choice. Due to its size, central position in the Aegean Sea and natural wealth, Naxos has been self-sufficient since antiquity. Naxos is well known not only for its traditional cuisine but for the local products that are made of. It's olive oil and fruit was renowned throughout the archipelago, while its wine was likened to the nectar consumed by the Gods. The island also produces excellent thyme honey and good wine, while the potatoes of Naxos have a history, taste and fine quality that has made it famous. There is a wide variety of restaurants and taverns with good quality food to choose from. Top tip :For lunch or dinner if you prefer your meal cooked with local products you should try Glyfada – Beach Tavern . A big portion of their food grows in their garden behind! We are not a “party” island, but there is plenty of nightlife that goes throughout the early hours in the morning! Top tip: Calm nights by the sea with a glass of good wine? Must visit Agia Anna and Plaka. More of a party animal? Then Naxos city should do the trick! No wind? No such thing! You can expect 70%+ days during your stay here that will blow 15+ knots, with most common wind been 18-28+ knots. On the rare occasion that there is a couple of days with less wind than 15 knots, one of the best things to do is explore the island and numerous villages and try local products and Naxian hospitality. Naxos has a pretty good internet connection that varies from 30mbps to 8mbpsint remote areas. You can expect also that almost every tavern, cafe, shop to have free wifi access. Beautiful views from Zeus Mountain. There are lots of accommodation options, from cheap rooms to luxurious villas and beach hotels. The island has a reputation as “reasonably" priced. Top tip: A must is to explore the inland, so you should rent a car, motorbike, bike, or use public transportation. Cruising surrounded by the Naxos beauty! The quaint little Naxos Town. Sunset in Portara, Capital town of Naxos. Dimitris is a Chef cook on the island. 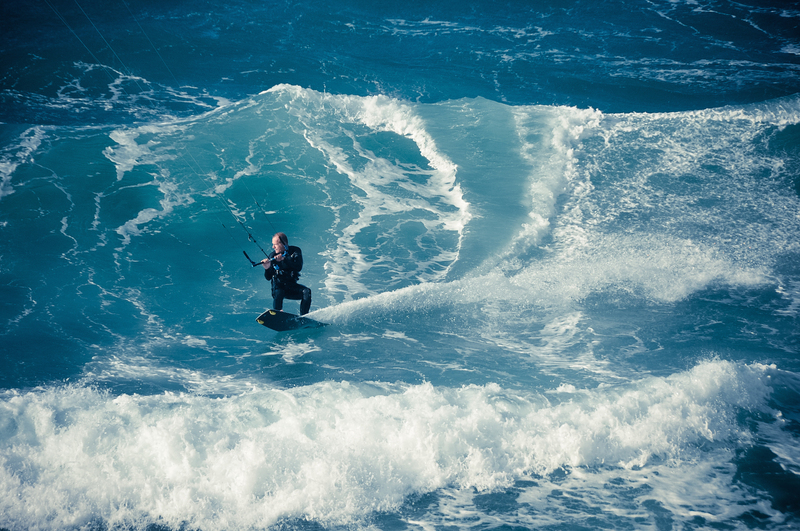 When not in the kitchen he is always kiting around Naxos island! Been to Naxos Island? What did you think? 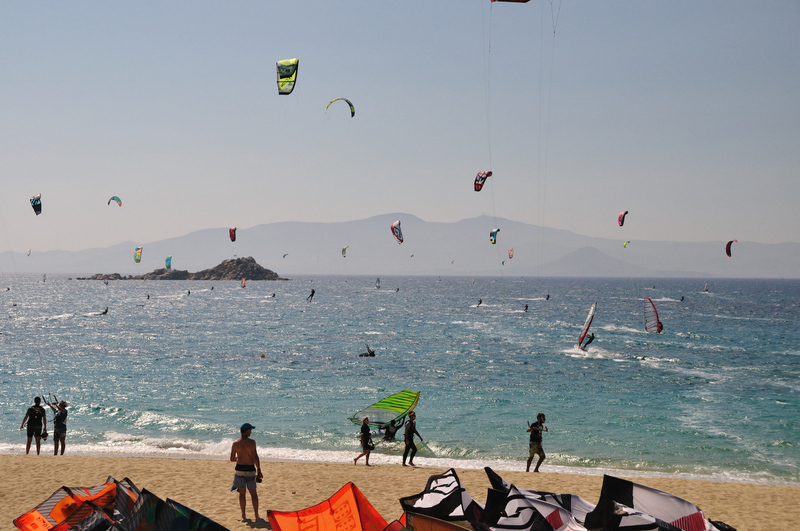 Where are the Best Kitesurfing Beaches in Naxos Island? Unspoiled location, super safe bay with a mix flat water, small chop and small waves. This spot is big enough to never get overcrowded and with a fine sandy beach, it is safe for all levels. Another safe bay, with side-on shore, choppy conditions. 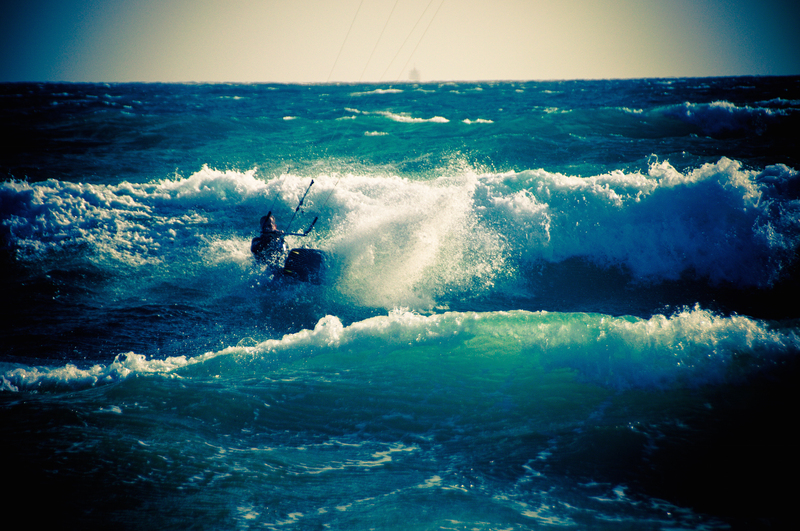 In July and August it gets too busy with both kiters and windsurfers,so its better to go early or late afternoon when it is less busy. This spot is also blessed with a fine sandy beach and is safe for all levels. This spot works only until Spring and starts again Autumn due to bystanders, swimmers and works only with SW and southerly winds. This spot is best for intermediate or higher level kiters. The same as Agios Prokopios applies here to this spot. Harsh on shore conditions, it works all year round. With a mix of a sand and rocky beach, I recommend this spot to only experienced riders. Waves: Wind swell from knee to well double overhead. 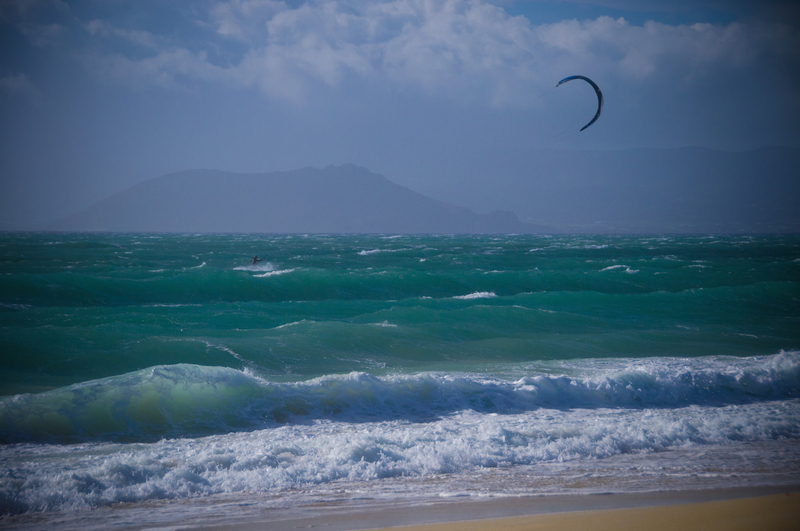 When is the Best Time to go Kitesurfing in Naxos Island?